The Tampa Bay Lightning travel to BB&T Center to play the Florida Panthers on Saturday, October 7, 2017. The opening line for this game has the Lightning at -140 and the Panthers at +110. Andrei Vasilevskiy had 23 wins and 17 losses last season in net for the Lightning. He had 1,480 shots against him and he gave up 123 goals. He made 1,357 saves for a save percentage of 92%. Victor Hedman accumulated 70 total points last season for the Lightning. He had 15 goals last year with 164 shots on goal giving him a shooting percentage of 9%. He had a total of 55 assists on the season and averaged 24.5 minutes played per game. Nikita Kucherov averaged 19.5 minutes of ice time per game last year. In that time he had a shooting percentage of 17% by scoring 40 goals on 243 shots. He had 44 assists giving him a total of 84 points on the season. Jonathan Huberdeau scored 24 total points last year for the Panthers. He had 8 goals last season with 77 shots on goal giving him a shooting percentage of 10%. He had a total of 16 assists on the season and averaged 17.9 minutes played per game. Roberto Luongo had 17 wins and 15 losses last year in goal for the Panthers. He had 1,217 shots against him and he surrendered 104 goals. He made 1,113 saves for a save percentage of 92%. Aleksander Barkov averaged 19.4 minutes of ice time per game. In that time he had a shooting percentage of 15% by scoring 21 goals on 142 shots. He had 31 assists giving him a total of 52 points on the season. The Lightning allowed 258 power play opportunities and gave up 48 goals on those chances for a penalty kill percentage of 81% last year. That was 13th in the NHL. They averaged 30 shots per game and as a team shot 9.54% for the season. They allowed 30 shots to their opposition per contest and had a team save percentage of 91%, which was ranked 16th in the league. 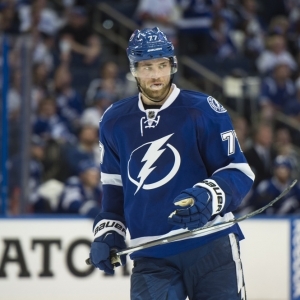 The Lightning had 94 total points last season, ranking 18th in the NHL in offense. They were 14th in the league with 234 goals while giving up 227 goals, which was 15th overall. They had 272 power play opportunities and scored 62 goals on those chances for a percentage of 23%. That was 6th in the NHL. As a team, the Panthers were 23rd with 210 goals scored while they were 11th in the NHL with 237 goals allowed last year. They averaged 32 shots per contest and had a team shooting percentage of 7.94%. They gave up 32 shots per game and had a save percentage of 91%, putting them in 14th place in the league. The Panthers had a total of 81 points last year, which was 23rd in the NHL. They had 45 power play goals on 265 opportunities for a percentage of 17%. That ranked their power play unit 23rd. They allowed 245 power play opportunities and gave up 36 goals on those chances for a penalty kill percentage of 85%, which was 2nd overall. The Lightning were 15th in the league in starting possessions in the offensive zone, doing so 50.7% of the time. Their defensive zone percentage was at 49.3% for the season, which was 18th in the NHL. They had 2,376 face-off wins compared to 2,609 losses, meaning their face-off win percentage was 47.7%. That was 29th in the league. On defense Tampa Bay had 1,842 hits and they blocked 1,014 shots from the opposition, which was 29th in the league. Tampa Bay was 9th in the NHL in Corsi percentage with 51% as they attempted 4,594 shots on net at full strength while they gave up 4,412 shots on net in the same situations. Their Fenwick percentage of 50.5% ranked 13th as they had 3,470 attempts while they gave up 3,398 shots on the defensive end. The Panthers started possessions in the offensive zone 52.9% of the time while their defensive zone percentage was at 47.1% for the year. That ranked them 6th and 25th respectively in the NHL. They had 2,384 face-off wins as opposed to 2,590 losses, meaning their face-off win percentage was 47.9%. That was 24th in the league. On defense Florida had 1,665 hits and they blocked 919 attempts from opposing offenses, ranking them 30th in blocked shots. Florida was ranked 4th in Corsi percentage with 51.7% as they tried 4,667 shots on goal while at full strength while they surrendered 4,362 shots on net when they had a full team on the ice. Their Fenwick percentage was 9th in the NHL at 51.2%, as they had 3,616 shots while they gave up 3,443 attempts on defense.